Do you love flowers? Roses, hydrangeas, baby breath and… sometimes a little joy is what we need to keep us happy and sane. Flowers are the nature of love, beauty and life that bring smiles. It symbolizes love and beauty and now we found the real preserved flowers that will last for a long time. 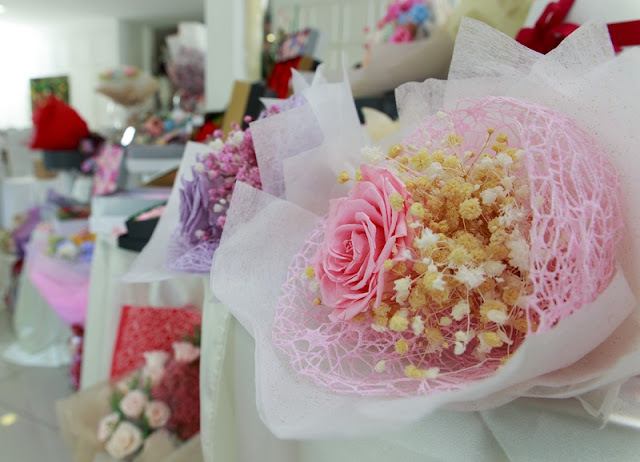 We were at an intimate LavieFlo 2016 Valentine Collection tea party recently. It was a lovely setup and full of flowers and roses of course. A journey of Pour Toujours began with the introduction of the collection by Ms Ellen and then the fun begins… We designed our own Pour Toujours experiential flowers box. There were a few types of experiential flower boxes for us to choose, mainly is the different color theme of the roses such as Amour, Luccious, Love Letters, Gracious. I decided on the Love Letters that comes with red, black and white roses plus it comes with bit of baby breath and hydrangeas for the decorations. It kind of fun and everyone was concentrating on their piece of art. Tadah… that’s mine, K for Kelly and these preserved flowers will last a long time. Perfect isn’t it? that lasts for eternity is a love that may hope for. It is an aspiration that most of us go in search of our lifetime. Let’s take a look at what LavieFlo 2016 Valentine Collection. This year the Pour Toujours collection is inspired by the concept of everlasting love and eternal memories. It’s uniquely designed to bridge better relationships between the giver and receiver, these artistic creations will not only evoke positive sentiments of love upon receipt, but also act as a constant reminder of the love of one’s life. The Pour Toujours collection comes into the main categories, namely Boxed and Bouquet. The latter is achieved via the use of preserved real flowers in the boxed and bouquet arrangements. When stored appropriately, these personal floral gifts will continue to bloom for years to come. These imaginative and artful creations are the perfect gifts for Valentine’s Day celebration. The Pour Toujours Collection is available at LavieFlo. The price for the boxed collection is from RM98 to RM688 and for the bouquet collection from RM168 to RM1688. Wow, these flowers can last for a long time, thats nice.. In the month of the Valentines, what else but flowers to express love?! The boxes and bouquets look amazing. Wow... black roses... never came across some yet... these flowers look super gorgeous and wow... they can remain for a long time.. how nice.. can someone send me some of these gorgeous blooms now??? The black roses look so beautiful. How was the smell ye? And Valentine's is just around the corner. These flowers look more attractive when they are packed in boxes. I love that the roses come in so many new colours these days. The flower is fresh and look nice. It suitable for wedding arrangement or any event. I hope to get one of those too! Looks super fresh and best of it that we can keep it for years! I think black roses are very rarely seen and looks so beautiful. I think we are going to see more of it this month. I usually get my flowers from White Florist in Taman Tun Dr. Ismail, reasonably priced and fresh flowers that they get from suppliers daily. Even on Valentine's Day they don't jack up their price to slaughter gullible men. nice present for valentines day. shall hint my dear of this flowers. The red and black combo in your experiential design looked so classy, good decision in choosing those two colours!